Some communities have serious litter problems. The Department for Environment, Food and Rural Affairs (DEFRA) estimates that clearing up litter in public areas costs local councils half a billion pounds a year. According to Keep Scotland Beautiful, £10 billion is spent every year picking up litter across Europe, with the annual cost in Scotland amounting to £73 million. Dropping litter in streets and other public places is illegal. In England and Wales, this means any place which is open to the air, even if you have to pay for access. 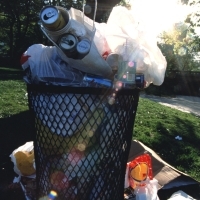 Local councils and the police are responsible for enforcing anti-litter laws. Local councils, English parish councils and Welsh community councils can appoint litter wardens to issue on-the-spot fines of up to £75 to anyone caught dropping litter in public. In Scotland the fixed penalty for a litter offence is £80. Offenders can also be prosecuted in a magistrates’ court - or in Scotland, the sheriff court - and fined up to £2,500.